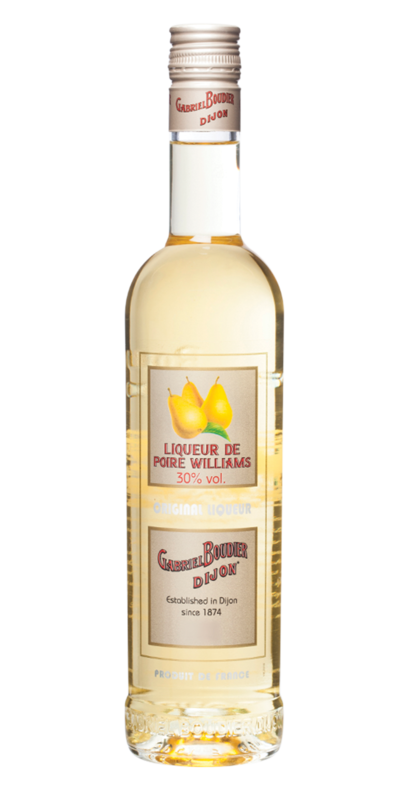 Gabriel Boudier Bartender Williams Pear Liqueur | Bartender Liqueurs | Flavoured Liqueurs — Emporia Brands Ltd. Knowledge and expertise of more than 140 years is at the heart of the House of Gabriel Boudier. A name that is now renowned worldwide. Since its foundation in 1874, Gabriel Boudier has invented and diversified into a range of exceptional products that delight enthusiasts of crème de fruits as well as liqueurs. Gabriel Boudier is now synonymous with authentic tastes which we invite you to discover, enjoy and share with us. The Gabriel Boudier Bartender range is par excellence for times of celebration and fun. The name denotes a trend-setter or aficionado, the Bartender range leads the way and keeps you company at sociable and relaxing occasions. This Williams Pear Liqueur is the result of Gabriel Boudier’s experience both as distillers and liqueur makers which enables us to combine two different processes: maceration and distillation. Some of the Williams Pears are distilled in order to obtain the most volatile aromas, while the others are cut in half and, after removing the stalks and pips, are macerated for 5 months in fine spirit to obtain all the naural oils and pectin of the Williams Pears and the heavy aromas that do not transfer during distillation. We then combine the results of the distillation and maceration and add a little sugar to produce this fabulous liqueur. Nose: Wonderfully clean and pure fragrant ripe pear skin and flesh. Palate: Rich flavoured ripe pear skin and flash with floral notes.